Real Madrid planned this pre-season with a very tough challenge on their early schedule, by including a trip to Lisbon to face Benfica, when still deprived of several key players. Benfica humiliated the Merengues by imposing a harsh 5-2 loss, just the day before Real Madrid takes off to their United States tour. Real Madrid was challenged by SL Benfica to play the "Eusébio Cup" this Friday night, but ended proving that the team is still too green for very competitive games, after losing 5-2 against the Portuguese side. With the likes of Ronaldo, Pepe, Marcelo, Sergio Ramos, Xabi Alonso, Ozil or Khedira still unavailable to give their contribute to the team, a "second line" Real Madrid struggled to create difficulties to a side who finished second in the Portuguese league last season. Callejón scored a brace, but a very weak Merengues defense was unable to stop an enthusiastic attack from a highly motivated side and ended up conceding 5 goals. The last time this had occured has been precisely against Barcelona in the Camp Nou (November, 2010), with a 5-0 result that trembled Real Madrid's pride back then. José Mourinho still can't count with many first team players, but the sector being the most affected is clearly the defense. With Casillas, Pepe, Sergio Ramos, Marcelo and Arbeloa still out of the picture, the team naturally lacks any kind of consistency when it comes to defend and especially when facing a strong team like Benfica. Moreover, the Portuguese side is already at a more advanced stage of their pre-season preparation, which clearly didn't help the Merengues aspirations in this game. The 5-2 final result might seem to harsh on a first glance, but with the return of Cristiano Ronaldo and several other key players in the upcoming days, we'll definitely see a massive improvement already during the United States tour. 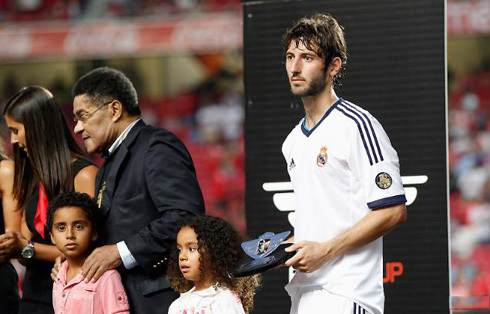 The game started with an early goal by a former Merengues player, Javi García, beating Adán for the first time on the night, from a good header shot. Real Madrid reacted and hit the back of the net twice in a short period of time, both scored by Callejón. 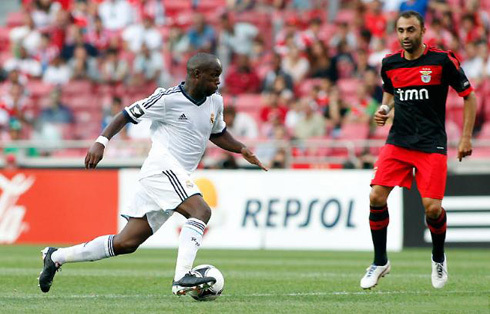 The first one took place on the 18th minute, after a long pass by Diarra that met Angel Di María close to the sideline. With just one touch, the Argentinian winger left Benfica's defender Melgarejo behind him and assisted Callejón for the equalizer. Two minutes later, Callejón added another to his count after picking up a pass from Gonzalo Higuaín and finishing a 1-on-1 situation against Benfica's Brazilian goalkeeper, Artur. Real Madrid's lead didn't last too long and once again, Benfica found an easy way to score from a free-kick cross. Carlos Martins found Alex Witsel free inside the area and the Belgium midfielder headed the ball past Adán, levelling things at 2-2. 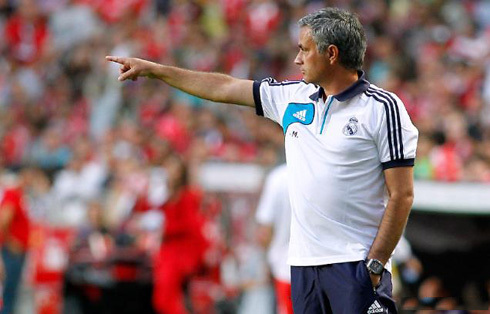 The Merengues passivity when defending certainly didn't impress José Mourinho at all, but having in mind how early the team is in their pre-season preparation and also the fact that the usual starters are yet to arrive, everything should be relativized at this point. The second-half took off with another Benfica early goal and this time no one can really be blamed, except perhaps for Adán, who seems to have been caught off-guard. Benfica's Argentinian winger, Enzo Pérez, striked the ball while being still near the corner flag and got rewarded with an impressive goal that alllowed Benfica to restore the lead. Six minutes later, Benfica extended that lead, from one of the best plays produced in the match. Enzo Pérez found Alex Witsel with space, close to the right edge of the area and the Belgium player quickly passed the ball back to Carlos Martins, who was coming from behind and with his aim locked at Real Madrid's goal. Adán couldn't have done nothing to stop it and Real Madrid had just fallen two goals behind. The final result was set close to the final whistle and once again by Enzo Pérez. The Argentinian chipped the ball over Adán with class and closed the night in style, forcing Real Madrid to leave Portugal with an harsh 5-2 result. Cristiano Ronaldo is expected to join his teammates tomorrow (28-07-2012) and should already start training with the team in California, at the United States.